…My Name Is Will is two stories in one. First, we meet Willie Shakespeare Greenberg, a graduate student at UC Santa Cruz in 1983. He’s busy getting high, avoiding working on his master’s thesis, and trying to sort out how to support himself without actually working. Willie is the quintessential slacker, and yet there’s some ambition underneath the pot smoke; he truly loves Shakespeare and hates having to reduce the plays to grad-student glop to regurgitate on paper for his professors. Willie takes a bus to San Francisco ostensibly to do research for his thesis (but really to earn some quick cash delivering a few banned substances and hook up with his girlfriend), and ends up having to find his way to a Renaissance Faire to deliver the goods. Meanwhile, in alternating chapters, Winfield also tells the story of eighteen-year-old William Shakespeare himself, a horny young lad with no plans to write or act. In the modern-day sections, Willie uses one line of one of the sonnets to posit that Shakespeare was a persecuted Catholic; in the Elizabethan story we find out that Shakespeare (at least Winfield’s version) is indeed Catholic, his family part of the rebellion struggling to keep their faith alive when it has been banned. He finds himself fleeing Sir Thomas Lucy, whose mission it is to punish those who are caught at Catholic mass, and also fleeing the relatives of Anne Hathaway, who is pregnant with Shakespeare’s child…. Renaissance People - Vyktoria Pratt Keating and Pure Dead Brilliant. Have you ever experienced anything that is pure dead brilliant? If you’ve made the trek ‘over the pond’ to the United Kingdom, perhaps you’ve heard this Glaswegian phrase. It’s used to enthusiastically describe something that is really great. Well, here’s your chance to experience something really great, right here in the Verde Valley. Flagstaff Celtic sensations “Pure Dead Brilliant” will team up with Sedona favorite Vyktoria Pratt Keating for a special dual concert of Celtic music at The Old Town Center For The Arts in Cottonwood on Friday November 27th at 7:30 PM. "I put on my dress," she said. "Putting on the costume really brings it out. When you put the costume on and when you walk outside the castle, it just kind of comes to life." Janelle Harrison, a sophomore at Ankeny High School, started as a member of the fairy troupe. She's went on to play the pirates' cabin boy and first-mate and served as a lady-in-waiting. This year, she's the baroness' daughter, Lady Audrey Mansfield. Corinne Harrison said she enjoys being part of the faire because it's fun and different. But the main reason she does it is for her daughter. "It's good for her to have something else to do other than being involved in the drama at school, drama of being a teenage girl, the drama of divorced parents," she said. "I feel that it's good to have something completely different that's not just your home life and your school life. You have something that's so different that will also look good on scholarship resumes, college resumes, job resumes." It's also about life experiences. "She's reaching outside of the box and doing something different," Corinne Harrison said. "Anytime you're acting like that I feel it makes you more prepared for going out in the world for jobs and whatever comes your way." Janelle Harrison said she jumped at the chance to climb the ranks and become a member of the Royal Court. "The queen asked me to be a lady-in-waiting of the court," she said. "Of course I said yes, because that's what I've wanted to do since I was little. I've always looked up to them and I thought it would be the coolest thing to be on the court…"
Although much of the faire events are somewhat scripted, there's also a lot of ad libbing, Janelle Harrison said. That experience, as well as the chance to interact with adults, gives her skills she wouldn't otherwise have. Janelle also had the honor of playing the role of Princess Margaret, the queen's daughter, for one weekend this summer. "It's fun. You get to get outside of your box and completely be someone else and dress like you wouldn't normally," she said. "I get to be creative and I get to ad lib a lot. I get to come up with my own character…"
to enjoy making the children in our audiences laugh," she said. While a member of the Royal Court, Corinne gets to play a widowed baroness this year, who is recently out of mourning. "I was hired as the court flirt," she said. "Everyone walks around prim and proper with their noses in the air ... very stately and royal and proper ... and I'm leaning out of the line going 'woo-woo' at all the men. "A lot of it is to teach people about the 16th century," Janelle Harrison said. "At the royal audience, people get to ask us questions. It's a great learning experience." The court also performs three authentic dances. "They are pretty simple," Janelle Harrison said. "They aren't too complicated because you can't do much in hoop skirts. You're really just showing off your dress and it gives you a chance to flirt with the guy you're dancing with." ….The Festival has also been special for the Ilah and Jeremy Groom family, who moved to Overland Park from Winfield, Kan.
“Jeremy’s company transferred him here. We didn’t know anyone. We were searching for avenues open to us in the theatrical field. We were active in musical theater at Southwestern College and at a dinner theater in Winfield,” Ilah explained. When she heard about auditions for the Renaissance Festival in April she decided to try out. “Jeremy and our daughters, Autumn, 9, and Sakura, 7, went along for support. Everyone we met was so friendly. They urged all of us to audition. We did and a week later they called and said, ‘We’d like to have all four of you.’ We became the Chandler family and we’re candle-makers,” she said. “We don’t actually make candles. We wander through the lanes interacting with visitors, telling them about candle-making. We also sing with the Canterbury Camerata and take part each afternoon in the Human Combat Chess Match,” she said. “It’s turned out better than we ever imagined. It’s been special to have all the family together. The cast has welcomed us like family. They’ve made us feel so comfortable. We’ve made friends and we’re already planning for next year’s Renaissance. Autumn wants to be a fairy,” she said…. …Joust Evolution founder Kevin Coble serves as a physically intimidating reminder that the jock from high school could also be underneath that armor. Coble, a former minor league hockey player and martial artist, has been jousting for more than 10 years. He'll be on his horse all three weekends of the Des Moines Renaissance Faire as Judas the Unforgiven, a villainous knight, taking on more noble foes. While the matches are staged, they still involve getting knocked off a horse by a hard lance. Coble has had five concussions, among other injuries. He said broken fingers are so common that riders don't even count them as an injury. "It's not a matter of you might get hurt. You will get hurt doing this," Coble said. "Sometimes it feels like you got hit by a car. Something has to give, either the lance or the guy flying off the horse. I equate it to a full body check in hockey." Over the course of the year, the knights of Joust Evolution perform at more than a dozen events around the midwest and south. They're constantly evolving the act, adding new bits and storylines that extend beyond the jousting action. Squires, sword fights and more take place on the sidelines. Coble recently added limericks to his Judas routine, mocking his opponents in AABBA form. "There aren't a lot of limericks related to knights and jousting, so I take established limericks and change a few words," Coble said. Coble and his crew also build up their characters, similar to how it is done in pro-wrestling matches (Coble also wrestled). They clearly lay out who is the good guy and who is the bad guy. At the end of the match most spectators will walk away happy that the hero was victorious. "It's choreographed, but it's still painful and real," Coble said. "It's very much a sports entertainment show…. Sandra is a 30-something San Antonian whose tastes and inclinations have always run to the eccentric. Smart and articulate, Sandra’s had more unusual jobs than usual jobs. She’s done retail and customer service, but her preferred lifestyle is creative; she started traveling the country on the Renaissance Faire circuit (whose workers and adherents are known as “rennies”) years ago, working food and crafts booths, making costumes and jewelry, doing hallucinogenic drugs, and even performing in the dreaded “Drench the Wench” dunking booth. ...Chris Muetz… and his family are "Rennie" fanatics. Although they've been attending renaissance faires for quite a while, Muetz's wife, Laura, daughter, Lizzy, and son, John, first started working at the Bristol Renaissance Faire, Kenosha, in the summer of 2008. As members of the Guilde of St. Lawrence, they volunteer to cook an affordable meal for the cast and crew of the faire while imitating middle class merchants and townsfolk. "Its' awesome," said Lizzy, a 16-year-old Parker High School junior who also loves to read. "Going to a renaissance faire is like being (a character) in the book," she said. John, 13, loves being around the people at renaissance faires. "They're kind of weird in a good way. You can be yourself and be silly," said the Franklin Middle School student. 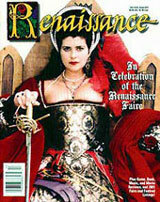 Laura, 46, likened a renaissance faire to "walking into a novel and being part of it." While at the faires, Laura, John and Lizzy are always dressed in garb—layers of costumes Laura created from colorful linen tablecloths and upholstery fabrics. The three are full cast members at Bristol and performed in 2008 at the Janesville Renaissance Faire, where you'll be able to see them again this year. "We represent the middle class of the Elizabethan society, are the food co-op for the faire, and prepare and serve the food the characters eat," Laura said. Laura portrays Beatrice Greenwood, aunt of the innkeeper's wife. Lizzy plays Grace Brunswick of the middle class, while John is Thomas Taylor, apprentice of the innkeeper. "We're not allowed to break character" while at the faire, Laura said. All three attended the Bristol Academy of Performing Arts, a requirement to work at Bristol. During the six-week course, they learned about manners, etiquette and speech to make the faire a pleasing experience for patrons. They also learned about safety and how to avoid heat exhaustion in their multi-layered costumes, Chris said. Laura, Lizzy and John hope to soon enroll in advanced Bristol performing arts classes that focus on dialect, costuming, props, character development, dancing and singing, they said…. In addition to being part of the Bristol Renaissance Faire every weekend after Memorial Day through Labor Day, the Muetzes also attend other renaissance faires throughout the Midwest. …Charlie Andrews does the full-contact jousting he does, in armor and on horseback, at Renaissance festivals. If you think the image is jarring, wait until you see the actual jousting. "I love it," said Andrews, 38, of Eagle Mountain. "I love the competition, the violence, the hard-hitting nature of the sport. I love that's it's a competition of man against man. I love working with my horse as my teammate. I love that you can't lose because of a judge's bad call. I love walking around a Renaissance festival and feeling really cool, like a rock star at a concert." "You do get a lot of injuries," Andrews said. "I almost died there years ago. I broke my ribs and punctured a lung, and I had pulmonary embolisms. You get hurt a little every time you do it, but if you're good, you only get hurt really bad maybe once a year." Andrews founded a jousting group, the Knights of Mayhem…. His jousting name is Sir Charles of St. Andrews. "I played rugby when I was younger," Andrews said. "I did rodeoing in high school. I've been in the military. I've done a little bit of ultimate fighting. I've been in combat. The next evolution for me was something like this. It's just so unique. In the year 2009, how many guys wear armor and do full-contact jousting? Not the sissy jousting they do at Medieval Times dinner shows. Nobody does what we do." Andrews, who is 6-foot-4 and 250 pounds, gets into his custom armor, which weighs about 150 pounds. Suits of armor cost about $6,000 for a plain suit, and as much as $30,000 for those with ornate decorations. Andrews uses a 12-foot lance made of Douglas fir, which screws into his chest plate. He and his opponent run their horses at each other, each going about 20 miles per hour. To score a point, they must use their lance to hit a grid attached to their opponent's breast plate. Andrews said he jousts full time and owns a California business, Trident Security & Associates, that supplies bodyguards to people around the world. "It's one of those businesses that thrives in bad economic times and post-9/11," he said.